Soldiers are stationed all over the world working hard and risking their lives so we can be safer. What a lot of people don’t realize is the number of dogs working alongside these soldiers helping to keep them safe. 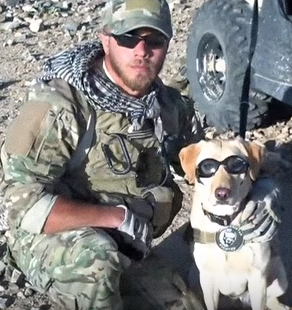 One such dutiful dog was a yellow lab called Taylor, a.k.a “Tay-Tay” and “Prince Taylor,” who was so effective at protecting her fellow soldiers the Taliban had a bounty on her head. This amazing hound went everywhere with Sgt. Tom Hanson and helped to discover bombs under his feet, saving his life on numerous occasions and vice versa. Thankfully this smart dog Taylor was able to retire from his military dog duties which meant her life was no longer in danger. You would think that these dogs could just be given to the soldiers that they bonded with but it’s not that easy. These types of dog adoptions can costs thousands and are not always possible. That’s where Molli Oliver comes in. This guardian angel works as a United flight attendant, but in her spare time she reunites military men with the dogs they served with. Using her own money, Molli flies military dogs home so that their soldiers can adopt them and give them forever homes. The video below shows Molli flying first class with military dog Taylor. Watch the wonderful moment when this nervous dog dad is reunited with his sweet Taylor and have the tissues at the ready! This woman performs selfless acts for the benefit of people she’s never met! What an incredible woman Molli is. Please share to pay tribute to her and all the military dogs that sacrifice their lives to keep our soldiers safe. We salute you all!